Local officials urge people to stay home and wait for water in flooded streets to recede before traveling to celebrate the rest of July 4th. Street flooding has been reported in the metro Houston area along the SW freeway (HW 59) and Interstate 10, in SW Houston, NW Houston and west Harris County. Stay tuned to the National Weather Service, local television station broadcasts, emergency management, flood control district officials on social media for updates. Freedom Over Texas Special Events Susan Christian and Houston Mayor Sylvester Turner canceled Houston’s July 4th celebration for safety reasons. However, the fireworks show will go on at 9:35 p.m. Christian said ticket holders will get a refund, but it will take some time. Eleanor Tinsley Park will be closed for those who wanted to watch the fireworks there. The heavy downpours also flooded parts of the park. “I am a kid at heart. Very rarely do I want to cancel a fireworks show. Tonight the Freedom ver Texas fireworks show will go on. The show allows us to pay homage to those who have paid the ultimate sacrifice so we can enjoy the freedoms we cherish everyday.” Mayor Turner said at a news conference this afternoon and on Twitter. “We are asking people not to come to Eleanor Tinsley Park. We do not want people to slip and fall at the venue. You can watch tonight the fireworks show on @abc13 Houston (KTRK-TV),” Mayor Turner said. Mayor Turner tweeted if your car was towed to call 713-308-8580 to check on the status or visit findmytowedcar.com. As the downpours continued earlier today, some streets flooded in Bellaire, West University and Southside and other parts of Harris County. Flash floods made driving hazardous at the intersection of Bellaire Boulevard and 610 South, Bissonnet to Fournace Place at 610 South and the Southwest Freeway and 610 interchange. 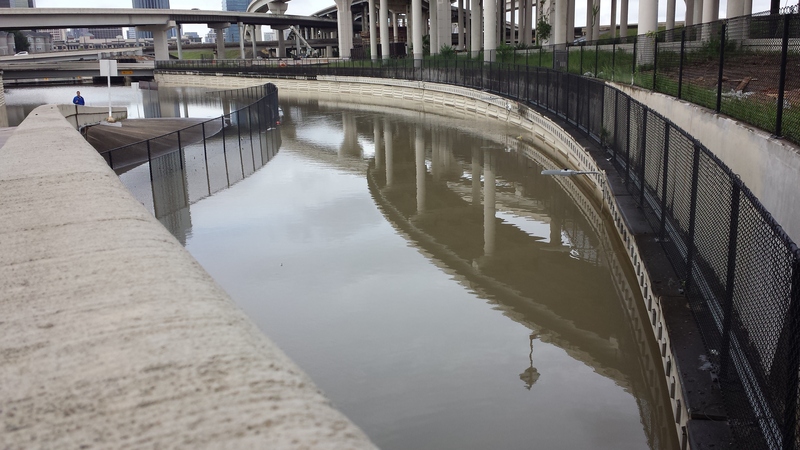 The Westpark Tollway at 610 South near Bellaire to and from the Galleria became filled with water. Since 2 p.m., water has receded in some of these flooded areas. Intersections in Bellaire along 610 South and Bissonnet Street were clear for travel by 5 p.m.
Below driving on Bellaire Boulevard from Rice Avenue to 610 South at 9:55 a.m. today. Bellaire City officials say they cancelled the annual July 4th Parade and Festival due to lightning. They also thanked the volunteers and participants for sticking it out and presented awards for the entries. This entry was posted in Houston News, Houston Weather and tagged Flash flooding Houston July 4th, Flash Floods in Houston on July 4th. Bookmark the permalink.